The Robert Glasper Experiment has a number of "tells" revealing the intentions of its namesake, the acclaimed 36-year-old American jazz pianist. Glasper's last two albums bear the name Black Radio, hinting at the fusion of soul, hip-hop and jazz within. That he submitted the first Black Radio record into the R&B category at the Grammys — and won — indicates his pop ambition. The name of the project itself, "Experiment," suggests both uncertain success and the possibility of discovery. Closing out the opening night of the Halifax Jazz Festival, the Experiment delivered a two-hour set that felt loose and exploratory even as it was delivered with top-notch professionalism, balancing virtuosic performance with immediate melodic hooks. 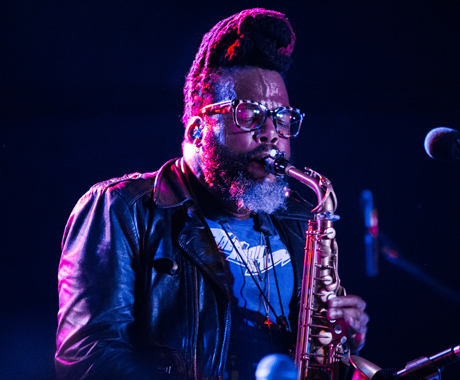 Though Glasper's Black Radio albums feature a litany of guest vocalists, it was just the four core musicians on stage at the Marquee Club, with keytarist/saxophonist Casey Benjamin's robotic vocoder doing most of the heavy lifting. Songs like "Let It Ride" and "Aw Yeah" twisted and turned, their jazz foundations bashing up against a litany of other influences. Each member of the band, which included bassist Derrick Hodge and drummer Mark Colenburg [Ed's note: this review original identified Chris Dave as the drummer] was given an expanded solo moment, but Glasper's was the most impressive, switching suddenly from jazz scales to harsh, almost electronic dissonance. When the band moved into the pop realm, they sometimes did so with subtlety — like weaving melodies of Radiohead's "Everything in its Right Place" into Herbie Hancock's "Maiden Voyage" — but, more often, engaged with the form rather explicitly: grooving on the hook from Bill Withers' "Lovely Day"; starting a slow-burning cover of Daft Punk's "Get Lucky" that exploded into a full-on dance party; and performing a mesmerizing, glistening take on "Smells Like Teen Spirit." In each of these cases, the band kept the skeletal frame of the original pieces in place but fleshed out alternate melodic possibilities — a sprawling maximalism that kept the Marquee Club moving right until the 2 a.m. curfew.